Valve Seat Cutting: How much is too much? Quote Reply Topic: Valve Seat Cutting: How much is too much? Well the valve job continues and things are going pretty well. Got the old guides out thanks to some great puller ideas from this site. Got the new guides driven in and reamed to specs thanks to more good info here. Now, I'm almost done cutting the seats with the Neway cutters. The seat on cylinder #4 exhaust has me asking this question. It was so far out of round and eroded on the inboard (cylinder) side, I've had to cut it down pretty far to begin to return concentricity. The area edged in red in the photo still needs to be taken down to get a good seal. I plan to cut the 60 deg inside and 30 deg outside cuts to make sure I keep the seating surface in specs (2.3 mm - 3.2 mm). Are there any consequences of taking the seat too far down? I know that inserts are one way of addressing this, however I live in a remote Alaska town and have no machine shop to counter bore for a seat insert. The only consequence I can think of is the valve stem contact with the tappet adjusting screw might be too far down with the adjuster screw all the way in - possibly address by taking a bit off the end of the valve stem. What am I missing here? Today I went ahead and started taking the seat down little by little - checking the valve stem to adjusting nut clearance. I also looked closer at the Neway manual http://https://www.newaymfg.com/literature/OperMan.pdf - they discuss runout on seat concentricity - the recommendation is not more than .0015 per one inch of seat diameter. Since we have 1.5 inches of diameter I figure .0022 max allowable runout. 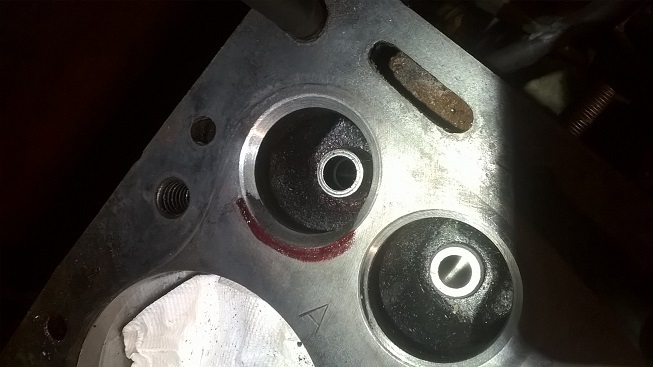 As I turned down the seat cutter, I checked the eroded corner with a .0015 feeler gauge until I could not insert it between the seat and the valve, then I knew I was getting close. A few more turns with the 45 deg cutter , then get the right width with the 30 deg and 60 deg cutters, and I have what I hope will be a good seal. After lapping it looks so much better than it did back in December when I pulled the head. And the stem to adjuster clearence will work too without any change to the stem length. Looking forward to putting it all back together this week and next.